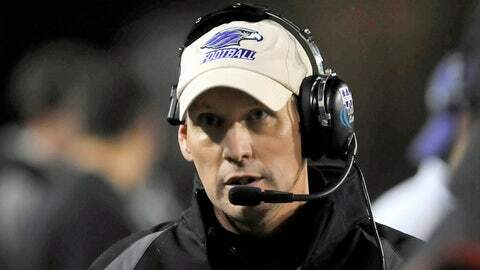 Wisconsin-Whitewater coach Lance Leipold (shown above in 2011) will lead the Warhawks up against the Mount Union Purple Raiders in the D-III championship Friday. Wisconsin-Whitewater football coach Lance Leipold saw that the campus bookstore was selling pin-on buttons that read “Beat Mt. Union” and had to intervene. Mount Union was not even on Whitewater’s schedule; an upcoming meeting between Whitewater and Mount Union was, at best, potential and, at worst, hypothetical. In the mind of a football coach, this subtle event was a harbinger of catastrophe, a signal that Rome was crumbling. And not from an enemy attack, but from the complacency of its own people. Mount Union coach Vince Kehres feels the same way. In Division III football, Mount Union and Whitewater are the mountain and the sea, rarely conquered by anyone but the other. Either Mount Union or Whitewater has won all but three of the D-III national championships since 1996, and they have faced each other in the championship game — the Stagg Bowl — in seven of the last eight years. Friday’s Stagg Bowl in Salem, Va., will make it 8-for-9, the one miss being last year, when injuries wrecked Whitewater’s season. Kehres says keeping players and fans in the moment is a constant battle. They are each other’s nemesis, but neither school will openly refer to the other as its “rival.” Whitewater, Wis., and Alliance, Ohio are separated by 500 miles, which by a D-III calibration is a lot farther than it is in the Big Ten. They don’t play in the same conference, don’t cross paths in recruiting and, apart from their size and football success, are not similar institutions. Whitewater is public, Mount Union is private. Mount Union recruits nationally, Whitewater recruits a 200-mile radius of its campus. Their strongest connection is their continuity. Both head coaches are coaching at their alma maters. Whitewater’s interim athletic director is a Whitewater alum, too. Kehres is only in his first year as head coach, but that’s because his father, Larry, retired in May and Vince got promoted from defensive coordinator. Larry is now the AD, and Mount Union is his alma mater, too. Division III jobs are not commonly thought of as destination gigs, but on the other hand not even Alabama gets to play for a national championship every year. Larry Kehres (332-24-3), Leipold (93-6) and Vince Kehres (14-0) have won a combined 93 percent of their games, resulting in what will soon be a combined 16 national titles. You ask any successful coach how he has done it, and the answer is never cinematic at all. They all have their own way of saying it, but it never has anything to do with scheme or inspiration or anything that sounds like fun. It’s always something about execution, efficiency, being a little better today than yesterday. And the reason it doesn’t sound fun is because it isn’t. “One of the most frequent texts I get from one of our former coaches is to make sure you enjoy it,” Leipold said. Good football coaches live inside a dark box of professionalized anxiety and paranoia, always worried about somebody’s footwork, some wrinkle, the media, or the bugs crawling all over their skin that nobody else can seem to see. Of course, it helps to have good players. When Leipold and Kehres go to a high school game, they’re looking for the same thing any other coach is. They want big, strong, fast guys who know how to play their positions. What they don’t have to offer, though, is an athletic scholarship. Those don’t exist in D-III like they do in D-I and D-II, so D-III schools have to look at kids a little differently. Kids who go to private schools like Mount Union rarely pay the full asking price on tuition, whether they are athletes or not. There is always a scholarship for this or that. Student-athletes still end up having to cover their own costs one way or another, but there is some relief. Leipold says there isn’t much he can offer a Whitewater recruit. Mount Union used to rely heavily on local kids too, but as America’s Rust Belt started to corrode so did Mount Union’s recruiting base. There just aren’t as many high school kids in Ohio and western Pennsylvania as there once were. The flip side is that it doesn’t matter as much as it once did. The Internet has made it possible to scout players from all over the country, and Kehres has found the state of Florida to be particularly bountiful. The state has an abundance of football talent, but not very many smaller-division schools. So some Florida players whose careers might otherwise have ended after high school are now moving to Ohio to play for Mount Union. And they’re doing it, genuinely, for the love of the game. They buy their own cleats, they pay for their own meals during training camp, they have to make it worth it. There is no other reason to play D-III football. So Friday in Salem the unstoppable current and the immovable mountain meet again. Not as rivals, exactly, but it’ll OK if somebody wants to wear a button.